Do you have just a few more books that you want to finish up before the end of the year? 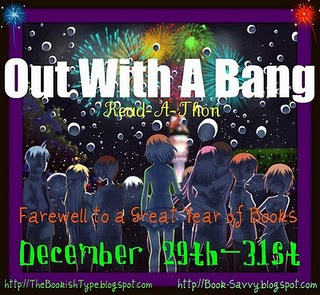 Well, you're in luck - The Bookish Type is hosting the Out with a Bang Read-A-Thon! In addition to reading some (hopefully) awesome books, there will also be some challenges and giveaways, all happening today through the 31st. I have one book that I definitely need to finish today, so I can take a bunch of tour books to the Post Office today in one big trip. Besides that, I just want to concentrate on having fun. Sure, it would be nice to get everything finished up by the end of the year, but I also don't want it to turn into a giant pressure cooker of doom if I don't meet my goals. So, have fun, everyone! I know I will!